Several Jewish organizations in Atlanta have responded to the disastrous flooding in southern Louisiana in August, from fundraising by synagogues and the Jewish Federation of Greater Atlanta to the collection of gift cards and sending of a van of Neshama volunteers by Temple Sinai. Temple Emanu-El had a hands-on response, thanks to a new nonprofit launched by member Sally Mundell. 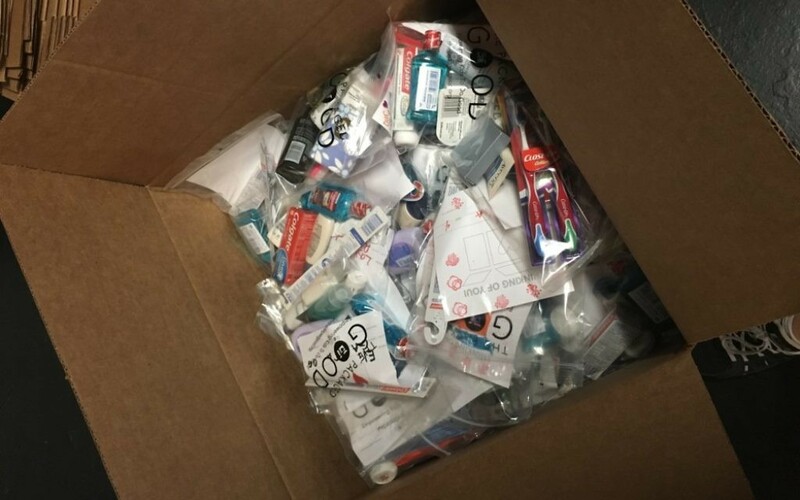 The Packaged Good, where volunteers pack bags of goods and prepare personalized cards for people in need, welcomed about 100 Emanu-El members to create 500 packages of toiletries for flood victims Sunday, Aug. 21. Half the packages were shipped to the Jewish Federation of Greater New Orleans for distribution in the Baton Rouge area; the other half were carried to Louisiana by a relief group from Mormon Helping Hands, Mundell said. Care packages, each with a personalized card, are ready for shipment from the Packaged Good in Dunwoody to the victims of the Louisiana flooding. The Packaged Good activated its pool of volunteers through email, social media, partners and friends, and Rabbi Spike Anderson at Emanu-El responded during the Friday night service Aug. 19, which he said had more children than usual because it was a prospective-member service and kindergartners through second-graders from the religious school participated. “We had an entire service where intertwined between the prayers were themes of water and how water could save but also could harm,” Rabbi Anderson said. During the service he told the story of an old man threatened by flood from a dam about to break. As a man of faith certain that G-d will save him, he refuses three offers of help to escape, and he drowns, only to learn when he angrily confronts G-d in heaven that those human offers were divine efforts to save him. “Oftentimes, help and salvation come through human intervention,” the rabbi said. “We can be the extension of G-d’s help and aid.” He thus urged congregants to volunteer at the Packaged Good. 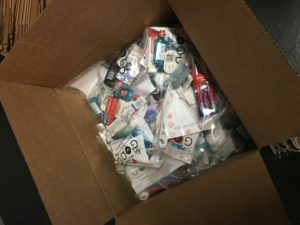 From her launch June 7 through Aug. 26, the Packaged Good prepared 3,400 care packages with the help of 16 charities and 600 people who visited the Dunwoody Village storefront, Mundell said. Her goal is 16,000 packages in the first year of operation. Whether more of them will go to Baton Rouge will depend on the feedback she gets from Louisiana about the needs there. To help meet its goals, the nonprofit shop is holding a fundraiser, Cocktails for a Cause, on Thursday, Sept. 15. The volunteers who will be there, she said, include 12-year-old Harrison Frank, an Emanu-El member and Davis Academy student, who is putting together a program for b’nai mitzvah students to work with the Packaged Good. Also attending will be Bahaumi Shah, 13, a budding videographer who is creating a series of videos for the Packaged Good, starting with one about the Louisiana effort. She also raised $1,364 for the nonprofit through efforts such as bake and garage sales. She’ll premiere the video and present the check at Cocktails for a Cause. The Packaged Good is working with several synagogues and with five nonprofits that support the ongoing needs of groups such as the homeless. Mundell’s operation is gearing up for a day of giving Nov. 13 to help the Friends of the Israel Defense Forces.